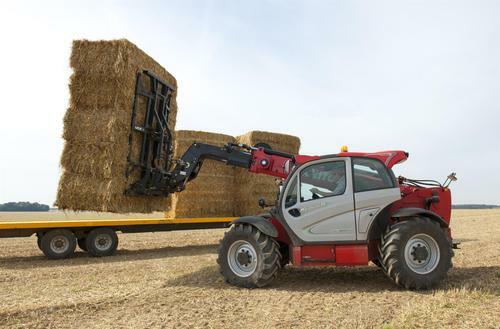 Materials handling equipment specialist Manitou says its new MLT 960 telehandler offers a strong combination of loading power and lift height to carry out heavy-duty tasks around the farm. The machine is powered by an Interim Tier IV John Deere diesel engine offering 141hp of power and features a Continuously Variable Transmission (CVT) gearbox for a smooth drive while maintaining maximum tractive effort at any speed. Manitou says the CVT reacts automatically to the machine’s demands to provide the correct torque and speed, allowing the engine to run at its most efficient speed for improved fuel economy. An inching pedal on the MLT 960 helps manage forward movement and hydraulic-powered attachment speed separate from the vehicle engine speed. Load sensing hydraulics is made possible by a variable piston pump which Manitou says can deliver more efficiency and less heat than a standard gear pump. Standard auxiliary hydraulics brings 3900 psi/270bar of pressure and a flow rate of 180litre/minute. A new Manitou-patented boom, the Duplex is mounted low on the MLT 960 to provide optimum visibility to the operator. To increase the lifting capacity, Manitou has reduced the overall weight of the MLT 960's internal components. Switches and controls have been grouped according to function for ease of operation. Drive, boom and hydraulic functions are all controlled via Manitou’s Joystick, Switch & Move (JSM) control, leaving the other hand free to operate the steering wheel. A highly-visible, side-mounted interactive dashboard digitally displays the hour meter, speed, travel direction and maintenance reminders. According to Manitou, the MLT 960 is a great alternative to large wheel loaders as it provides a fixed load capacity while turning; extended forward and vertical reach; and extra bucket curl. Its quick-fit mounting system allows for a wide range of Manitou-tested attachments including forks, rotating carriages, buckets, grapples, bale handlers and hay handlers to be fitted for use. A hydraulic lock option allows attachments to be switched quickly without the need for operators to leave their seats. For additional comfort, Manitou used cushion stops on the lift cylinders to provide a smoother operation when lowering and extending the boom. An optional Comfort Ride Control (CRC) boom suspension minimises the loss of material when travelling. The engine, cooling system and daily maintenance points have been placed for easy access under the large engine cover which can be lifted and held in place with ease thanks to fitted gas springs.